Nvidia has just reported its latest set of financials. In its Q219 results the graphics chip maker was keen to highlight that it generated record revenue from all platforms – Data centre, Gaming, Professional Visualisation, and Automotive. However, looking beneath the surface we learned that the "crypto gold rush is over," which has impacted both these new results and projections for Q3. 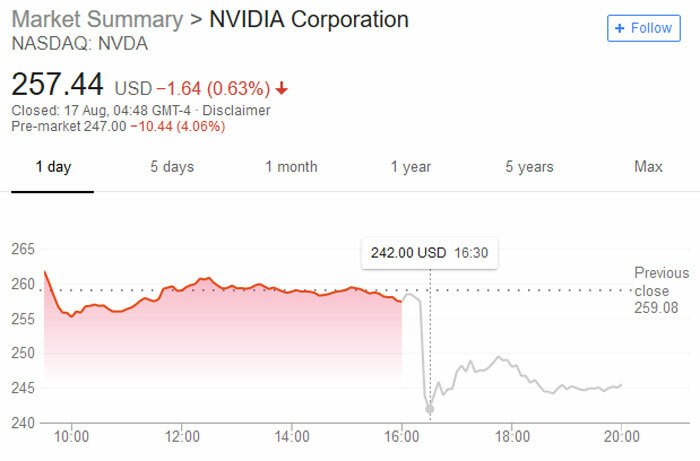 Hence the NVDA share price has dropped as much as 5.6 per cent in afterhours trading. Putting some number to the above positive and negative statements about Nvidia's fortunes, Nvidia reported Q2 revenue growth of 40 per cent to $3.1 billion and a GAAP net income of $1.76 a share, both above Wall Street analyst expectations, but the company forecasts revenue between $3.19 billion and $3.32 billion for Q3, below the consensus estimate of $3.34 billion. Back to details of the crytocurrency value crash impact, and we read that "Our revenue outlook had anticipated cryptocurrency-specific products declining to approximately $100 million, while actual crypto-specific product revenue was $18 million," according to a statement (PDF) written by Nvidia CFO Colette Kress. "Whereas we had previously anticipated cryptocurrency to be meaningful for the year, we are now projecting no contributions going forward." We know a big positive going forward will be the brand new Turing GPU with pro, enthusiast and mainstream products derived from this architecture selling rapidly, as long as Nvidia can produce enough to meet demand (at attractive prices). Nvidia CEO Jensen Huang explained the attraction of Turing with characteristic bluster, "Turing is the world’s first ray-tracing GPU and completes the NVIDIA RTX platform, realizing a 40-year dream of the computer graphics industry. Turing is a giant leap forward and the greatest advance for computing since we introduced CUDA over a decade ago." The financials added the bold statement that "Turing will reset the look of video games and open up the $250 billion visual effects industry to GPUs". At SIGGRAPH 2018 a few days ago Nvidia demonstrated its top-end new Quandro RTX 8000 ($10,000) rendering the Epic Games Star Wars-themed Reflections ray-tracing demo in real-time. How much of this rendering muscle trickles down to video games players in soon-to-be launched graphics cards remains to be seen. Which means that we're really, REALLY, spending too much on their products. Vastly overpriced. Nvidia net margins since the Fermi and early Kepler era have increased by 2 to 3 times. This year net margins are at nearly 40% and their gross margins are higher than Intel! Depends on your point of view - a shareholder could argue that as their sales are increasing, they are under-priced! They set their prices with regard to what the market will bear, and with an eye on the competition.